There is the beautiful Willow (yes, she is wearing contacts!! ), the energetic, over the edge, a brick shy of a full load Buzzer, and the loveable, charming Fransico. Who are currently looking for Rascal. (I have the rough draft of him). Thank you David for such great characters. 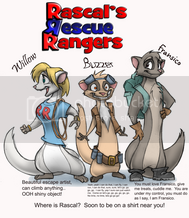 And folks, remember to buy your Official Rascal's Rescue Rangers items. Oh, just a little by the way. The images are copyrighted, and belong to the shelter. Pardon me for butting in, but here is another way to benefit the shelter! I created a ferret site called Ferret Fun, over at a place called Squidoo. Squidoo is a fairly new free service where you can create simple one page sites on any topic you like, and you can choose to donate the proceeds to charity (from Google links, or if someone purchases something from places like Cafepress, Amazon, or eBay). All of my Squidoo lenses are now set to benefit Ferrets Unlimited. 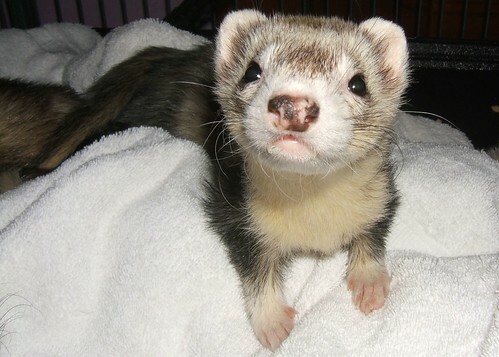 If you have a moment, please visit the Ferret Fun lens and please consider creating your own charity lens, as well. Please let us know if you create a lens that benefits Ferrets Unlimited and I'll gladly link to you.